Creativity of Aleksandry Kuzminichny Velikodna (23.04.1914 - 26.03.2002) is fine page from a history of the Ukrainian folk art. 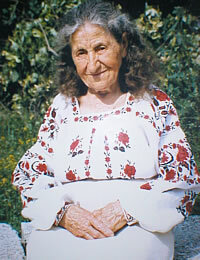 Velikodna Alexandra Kuzminichna was born in village Buhalivka of the Poltava area. In 1935 the talented girl started the labor activity from system of national art crafts of Ukraine. Persistently, step by step she overcame tops of skill. Alexandra Kuzminichna deeply knew and creatively continued traditions of national Poltava embroidery, masterly owned all secrets of technics of art embroidery. All creative life has devoted Alexandra Kuzminichna Velikodna to an art embroidery preferred soft, warm pastel shades brown, ochre, but more all - white with small impregnation of greenish, grey colors, having created for the life over 700 ornaments for a frame of female blouses on ancient national motives, man's shirts "chumachok", cloths, napkins, paths and another assortment. More than 60 years the Deserved master of national creativity of Ukraine took part in regional republican, all-Union exhibitions of products of national art crafts. The creative master, the participant of many international exhibitions. In 1976 of work of Velikodna O.K. were exposed in Tokyo, Canada, in the European museum of Brussels, in Bulgaria, in the United States of America, in 1977 at the international fair in Leipzig, Prague. Alexandra Kuzminichna in 1976 is awarded with the Diploma of the winner of the First World festival for participation in exhibitions, with the Certificate of honor of the Ministry of local industry USSR, letters of the Poltava house of national creativity for active propagation and development of national creativity - embroidery. Velikodna O.K. was awarded with Diplomas of the Ministry of culture of the USSR, Academy of arts, the Union of artists of the USSR. Alexandra Kuzminichna - the participant of II Republican festival of a folk art in 1987, the participant of all exhibitions which was carried out by the Republican House of national creativity. Many works of Velicodna are brought in catalogues. So her works are included in catalogues of the exhibitions devoted to 800 anniversaries of Poltava in 1984, Republican and regional, devoted to 350 anniversaries from G.S. Skovoroda's birthday in 1972, the regional exhibitions devoted to 30 anniversaries and 40 anniversaries from the date of the Victory. The creative master organized personal exhibitions in the Poltava local lore museum, the National Museum of architecture and a life of Ukraine.